Out My Window: Monday, Completed a chart and saving! Impressed with your savings! At the first of the year I decided to follow your lead and save all my 5's. I have paid for things with 20's thinking I would get some 5's to add to my stash of only 3 since the first week of January. I have been counted back 12 ones, 9 ones and 7 ones on 3 different transactions. What the heck? At this rate I will have maybe 30 dollars in my 5 envelope at the end of the year. For some reason all I am getting is 5's, which can also be a problem. I constantly have to go get more money. I am also following your lead with saving $5 bills. I think I have aboit $75 saved so far. Not too shabby in my opinion. Happy birthday to your Angel Franka in Heaven and to your aunt! Thank you Rachel. My eldest sent me a beautiful bouquet of flowers. What are you saving your 5's for Christmas? Kim, sometime you should read your old posts. You seemed so much less happy and forgiving of life and yourself, especially! I love reading your posts now. I don't know what, how or who changed, but your attitude is absolutely mind boggling. It is helping me learn to be kinder to myself, and that in turn seems to automatically have the effect of making me more compassionate toward my loved one. Thank you for sharing so honestly and letting someone who shares some parts of your story, celebrate your decision to be a light in the world. I think getting rid of the stress of the studio really helped. Also seeing that I could control myself and get out of debt has helped. The constant worry is gone. Also mother passing as much as I loved her she was so very negative and that was hard. I was raised by talented funny but very selfish negative people. Things learned in childhood are hard to overcome. I had a lot of those experiences with my family, too. I am just so happy that you able to be happy where you are now. I should have said in my first comment, that you are my favorite blog because we enjoy and do a lot of the same things, and you are always up to something! 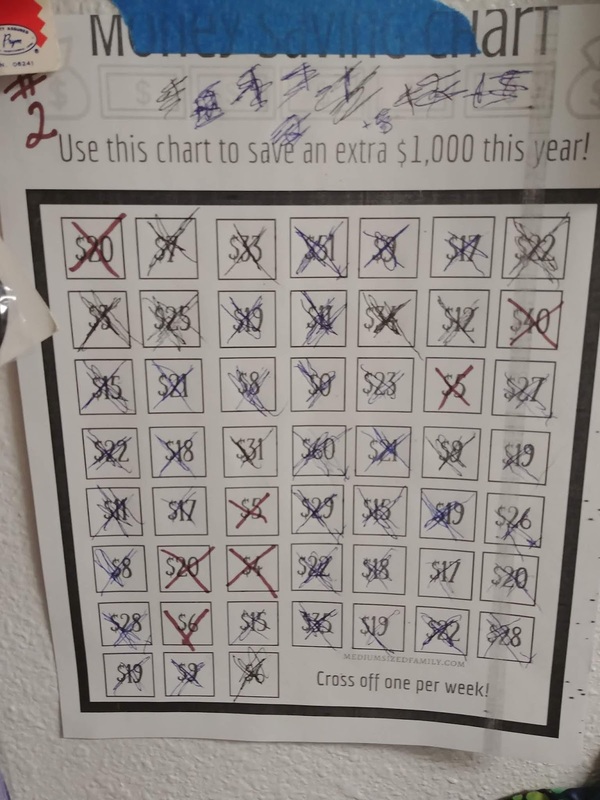 Every time I have extra money from a category, like groceries or gas or I have less spent in the budget on something I get to take that money and mark off so many squares. Also what ever is earned in the shop is added in, but the majority comes from savings.